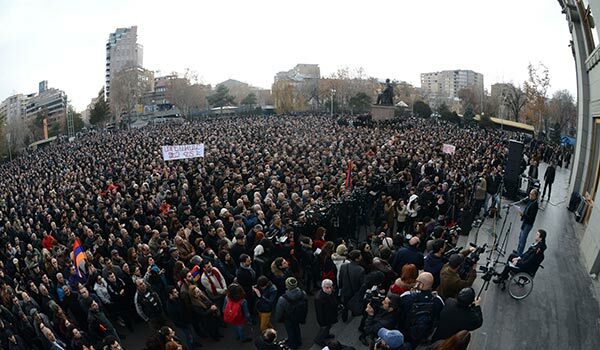 Thousands of Armenians gathered Sunday in Liberty Square in Yerevan for a third day of rallying in support of the official runner up of the presidential election Raffi Hovannisian, who called the rally a “manifestation of love and victory”. Hovannisian and his supporters say he was robbed of last Monday’s election in which official counts show him losing to incumbent President Serzh Sargyan by about 59 percent to 37 percent. The official declaration of the February 18 vote is expected tomorrow by the Central Election Commission. Meanwhile, Hovannisian has called for another rally February 28. While calling for unity by opposition forces, Hovannisian’s calls for mass gatherings are for many a reminder of a 2008 standoff that eventually led to the worst post-election violence in independent Armenia’s history, when 10 people were killed, hundreds wounded and dozens jailed. This season’s protest has been dubbed the “Barevolution”. “Barev” means “hello” in Armenian, and is a takeoff on Hovannisian’s campaigning methods, as he spent the campaign walking door-to-door to businesses and greeting people in the streets. No Armenian politician had ever used such campaign strategy and it resulted in Hovannisian gaining more percentage of votes in a general election than any opposition candidate since Vazgen Manukyan polled 40 percent in 1996. Police had warned that Sunday’s rally was unauthorized, as no municipal license had been issued. Hovannisian apologized for the unsanctioned rally, and thanked police for allowing the meeting, providing security and switching on the electricity to give a chance to people to gather.